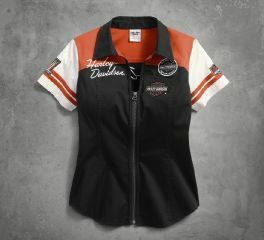 Harley-Davidson® Women's Performance Shirt with Coolcore® Technology is made from 92% polyester, 8% spandex Coolcore body. 100% polyester mesh extended side panels. Coolcore fabric wicks moisture from the body for year-round comfort through thermal regulation. This short sleeve tee features a snap down collar, button front, button chest pockets. embroidered graphics, and coolcore label. This bright Performance Mock Neck Top is a smart layer during or after a ride to help keep you cool. It's engineered with mesh side panels that vent and breathe. 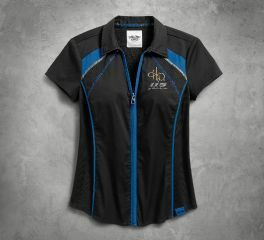 The zip neck on this women's short sleeve top also helps you adjust for more airflow. Stay Cool: Mesh side panels for airflow. 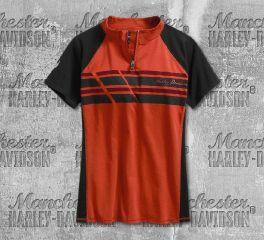 Materials: 96% cotton, 4% elastane jersey. 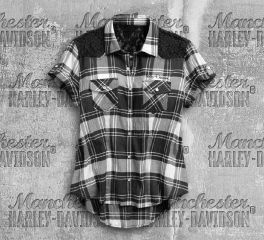 Embrace the super-soft feel of our Better On A Harley® Plaid Shirt. Styled from touchable, flowing 100% rayon, this women's short sleeve top sports traditional details including chest pockets and rolled cuffs. And about the name, zoom in for a glance at the embroidered chest patch. Materials: 100% rayon yarn-dyed plaid is washed for softness. Graphics: Woven label. Embroidered patches and graphics. Distressed printed graphics. Stand-out style arrives in the H-D® Racing Zip-Front Shirt. Details include: snap-down collar, sporty zip, turn-up cuffs, and classic colorblock design. Race inspo is evident by the sporty patches and embroidered lettering. And to keep you comfortable at the track (or in the saddle), this women's short sleeve top features soft, rib-knit side and shoulder panels for great range of motion. Material: 100% cotton twill is washed for softness. Rider-Friendly Features: Snap-down collar. Rib-knit side panels extend to back shoulders for improved fit and mobility. Design Details: Turned-up sleeve cuffs. 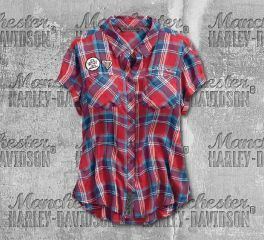 Add some plaid to your riding wardrobe. 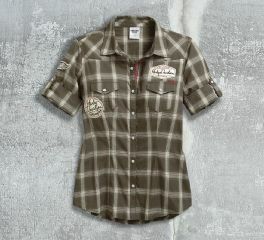 This crinkle-texture Downswept Wing Plaid Shirt is an awesome alternative to solid tees and tanks. 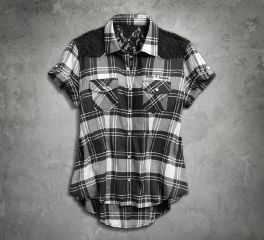 Lacy accents on the yokes and back appliqué make this lightweight women's short sleeve top a highway attraction. Pearly snaps and rolled cuffs finish the look. 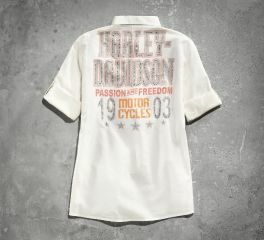 Harley-Davidson® Women's Passion Freedom Off White Short Sleeve Shirt is made of 100% quality cotton. Printed graphics with rhinestone embellishment on back. "Classics" is in the name for good reason. This one is styled with enduring details that will never go out of fashion. Colourblock design with contrasting stripes, embroidered graphics, traditional patches, and detailed appliqué give the Classics Colourblock Zip-Front Shirt timeless appeal. Our women's short sleeve top is fueled with more than enough heritage to make her next ride one for the ages. It's an honor to see our strong, spirited lady enthusiasts in Pink Label gear. This Pink Label Snap Front Shirt offers another strong option to support the cause of Breast Cancer Awareness. Pretty accents on this women's short sleeve top include: pearly snaps, rolled cuffs, and metallic graphics. Your confident attitude motivates your pursuit of adventure. We like that about you. 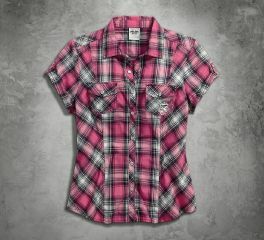 Wear our ladies' Genuine Short Sleeve Plaid Shirt on your next outing. 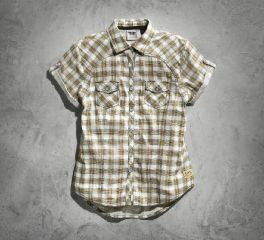 The unique crinkle texture, rolled cuffs, and pearly snaps are fresh updates to a traditional plaid women's short sleeve top. Live free, ride hard. We make the clothes to accomodate your mantra. The Women's Iconic Short-Sleeve Woven Shirt is proof. Pair with Harley-Davidson® bootcut jeans and biker boots for an enviable rally ensamble. Have some fun with fashion. 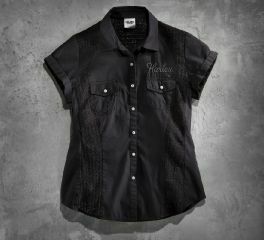 Lace inset panels lend a devious reveal in this short-sleeve shirt with rhinestone accented buttons.